As much as I relish my time in the kitchen–that methodical and soothing rhythm unfolding as you work a masterpiece–sometimes the moment calls for something semi-homemade. This is one of those moments. 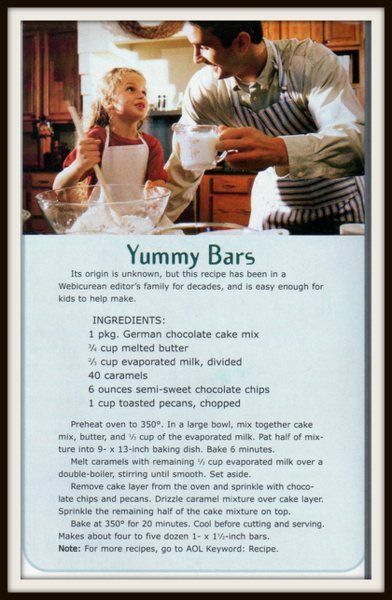 I wanted to prepare a sweet treat this week, and a quick stroll down memory lane brought me to the “famous” Yummy Bars. 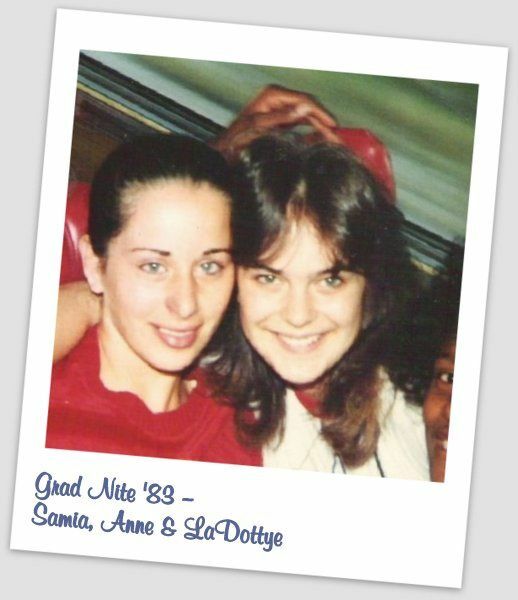 Perhaps we do this more as we get older, but I love pulling out the old yearbooks from time to time, browsing classmates’ inscriptions, reliving the year’s shenanigans from football games to cheerleading stunts to running amok on the field in the mascot uniform (Mustang) … to baking. Wait, baking? Yes, in my yearbooks, friends wrote about my cooking, specifically the “Yummy Bars” I brought to school. Sure, they could remember me for cheering our teams to victory, for my big spill on opening night of our production of Grease, or for leading the Adventure Club into the wilderness of Yosemite. But, no, it’s the Yummy Bars–they win out every time. 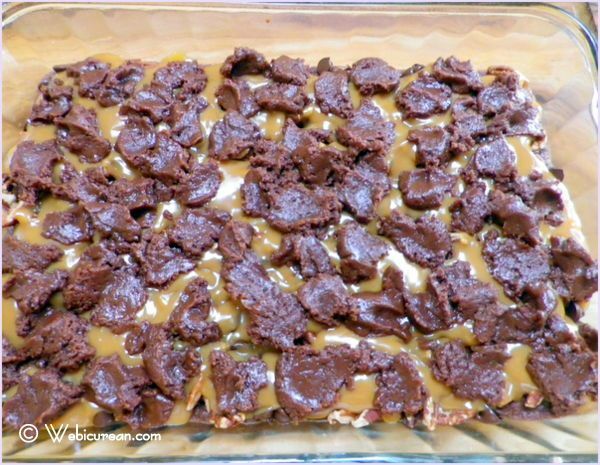 My sister (or maybe it was her neighbor Pam) got us started on these in the 70s–a sinful cookie bar loaded with dark chocolate, gooey caramel, and toasted pecans–easy enough for a kid to assemble and seriously good. What’s not to love? Ah, it’s just a feather in my virtual cap. These cookie bars are simple enough for a child to prepare (I did! ), and because they’re semi-homemade, there’s little fuss. It’s good to have a few semi-homemade tricks up your sleeve, so you can whip up something delicious, even memorable, at a moment’s notice. Now it’s time for a new generation to discover Yummy Bars, so let’s begin! Get all the ingredients ready. 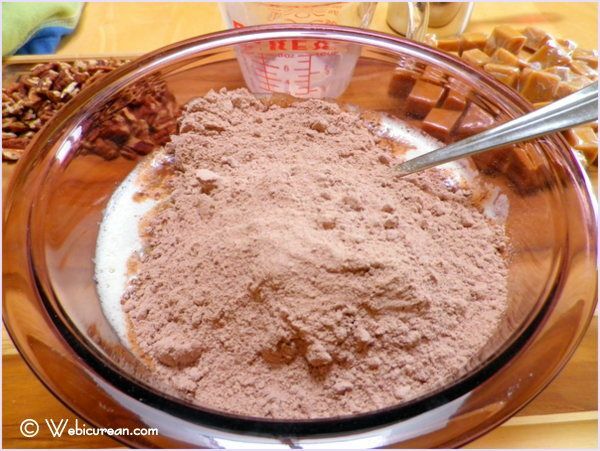 The original recipe calls for German chocolate cake mix. I’m not sure whether this even exists anymore, as I couldn’t find it, so I subbed in milk chocolate cake mix instead. The butter needs to be melted, so pop it in the microwave for few. This butter was frozen, so it took a couple of minutes to melt completely. Add the 1/3 cup of evaporated milk along with the cake mix to the melted butter, and stir until the dry ingredients are moistened. 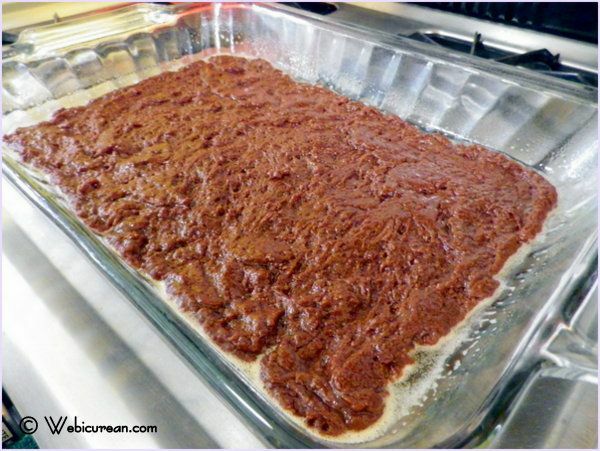 Spread half the cake batter in a lightly greased 9×13 baking dish, and bake for 6 minutes at 350. 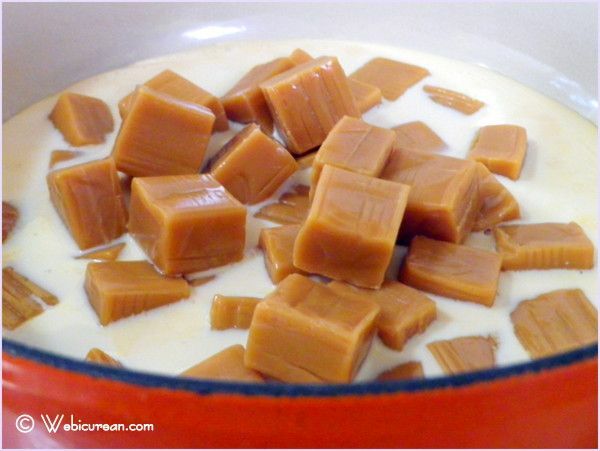 Meanwhile, melt the caramels in a pot with the other 1/2 cup evaporated milk. This will be the most tedious part of the recipe–unwrapping 50 individually wrapped caramels. Find a little helper for this busy work. 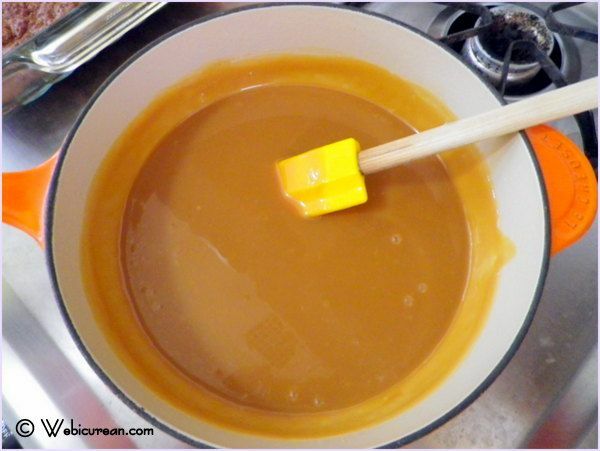 Once the caramel has melted, set it aside. The first half of your cake should be out of the oven and ready for the next steps. 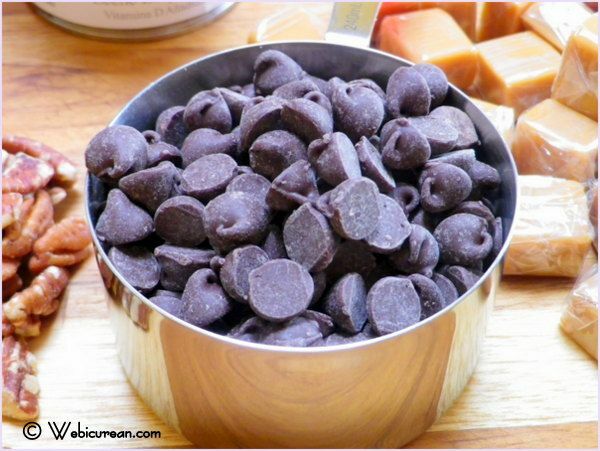 Sprinkle the chocolate chips and nuts evenly over the partially baked cake bottom. Drizzle the caramel evenly over the top of that. Crumble and press the remaining cake batter over the top of the caramel, then bake another 20 minutes or so until done. Allow to cool completely before digging in–Enjoy! 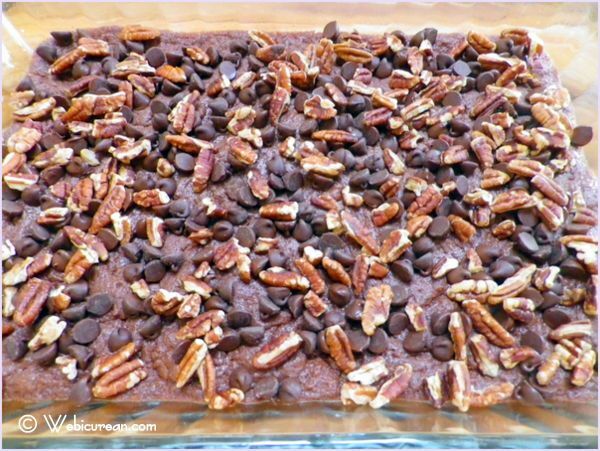 Quick and easy cookie bars loaded with chocolate chips, gooey caramel, and toasted pecans--a hit every time. 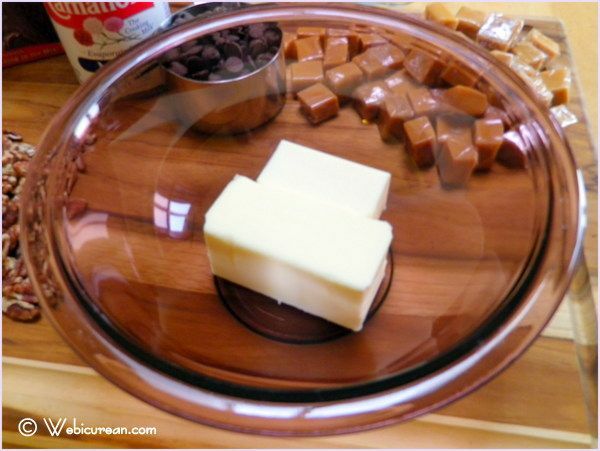 Mix together cake mix, melted butter, and ⅓ cup evaporated milk. Spread half of this in a lightly greased 9x13" pan. Bake at 350 for 6 minutes. Sprinkle chocolate chips and nuts on partially baked cake. 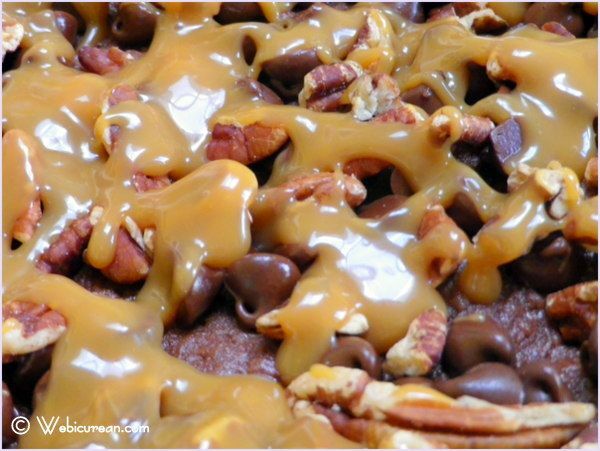 Melt the caramels with the ½ cup evaporated milk, and drizzle over the cake. Crumble and pat the remaining mixture on top. Makes 4-5 dozen 1- to 1½ inch bars. Next week let’s dig into the fall’s apple bounty with some harvest rice. I almost forgot how good these were until I made them this week–we practically lived off them back in the day! Did someone say caramel? And chocolate? These are super scrumptious looking. Pecans too? Yes please! Thanks! I wish I could pass some through the screen–we have way too many here to eat! These do indeed look very yummy! Thanks! 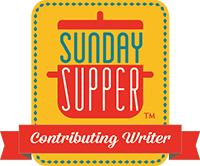 I just had to check out your jumbo lump crab cakes–they look awesome! wow…these need to happen asap. 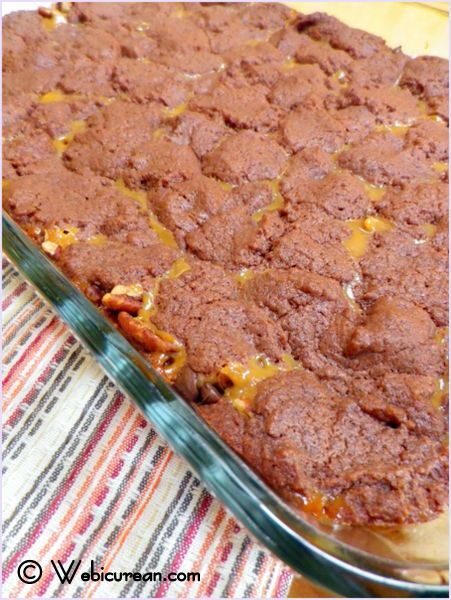 I found something (somewhat) similar using a german chocolate cake mix on Pioneer Woman’s blog – but I’ll use this recipe for sure…eek, can’t wait – I’m sure a sugarholic. You won’t be disappointed, promise! 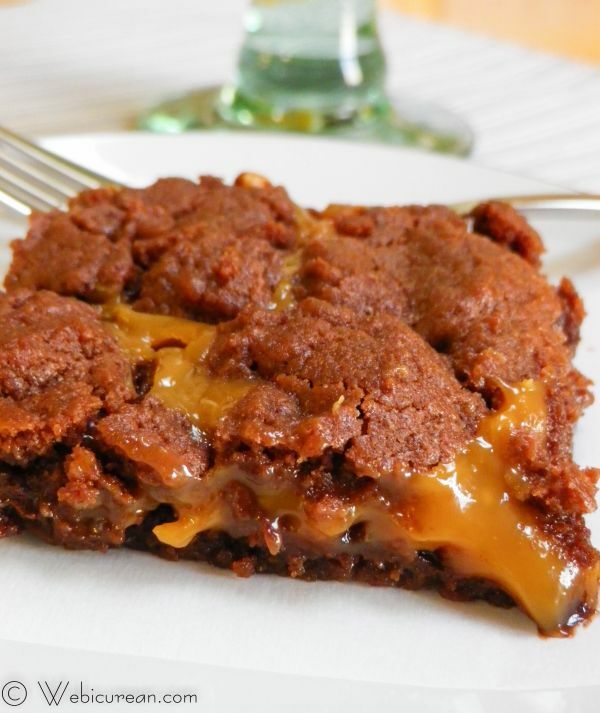 I just Googled PW’s version, and it’s virtually the same, except she calls them Knock You Naked Brownies. She didn’t seem to have trouble finding the German Chocolate cake mix though!